What Drawer is my Treat in Today? Your bird's very own set of "drawers"......to be exact "Three" of them to keep his favorite foraging treats inside. The 3 Stacked Pull out Drawers foraging bird toy consist of 3 two inch pull out drawers on 3 different sides. Your feathered friend must open the drawers to access their favorite food or treats. What makes this a great foraging toy is that each Drawer has a "stop" to prevent it from falling out or being removed by your bird. Add your birdie's favorite treats to each drawer and allow your bird to make his/her choice as to which one to open first. If your Feathered Friend becomes an expert at foraging you can add some shreddable paper just to make it more challenging. Also, comes with hanging vegetable tanned leather strap to add some chewing fun for your bird. 3 Sliding Drawers Foraging Bird Toy measures 14" long by 2" wide. 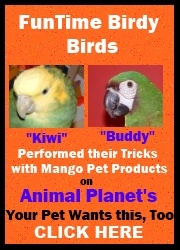 Ideal bird toy for Cockatiels, Conures, Senegals, Caiques, Quakers,Amazons, African Greys, Eclectus Parrots, Severe Macaws, small Cockatoos and all similar size birds. 3 Sliding Drawers Foraging Bird Toy by Caitec5MargaretApril 7, 2016He is loving this...this is the first one I purchased...will be purchasing more when needed. 3 Sliding Drawers Foraging Bird Toy by Caitec5theresa rautioFebruary 18, 2014LOVE this . Durable and my bird stays busy. Better she gets some food this way instead of a dish of it just being put in front of her. 3 Sliding Drawers Foraging Bird Toy by Caitec5Ron SelfApril 15, 2012See how smart you bird is by getting this toy. You will be supprised. It will keep them busy and wanting more. Remember, a happy bird is a healthy bird. This toy will make them happy. 3 Sliding Drawers Foraging Bird Toy by Caitec5HelaineOctober 14, 2011This is my bird's new favorite foraging toy. She loves to find new treats in different drawers. She bangs it around her cage to let me know when it is empty. My grey figured out very quickly how to open the drawers. I am thrilled with how much she is enjoying playing with this item and how much she is using all of the foraging toys purchased at Fun Time Birdy.